On this page, you can find out a little more about my career and the various things I have done - papers and articles I've published, committees I've served on, awards I've received, and projects I've worked on. You can even find a CV, although this may be out of date! I have been a professional Computer Scientist since the year 2000, authoring over 60 internationally peer-reviewed papers and articles (cited over 1000 times) and gaining a PhD in 2006. My research spans a wide range of topics within the Distributed Systems domain, with an emphasis on Big Data Analytics, Cloud Computing, Decision Support, Energy-efficient Computing, and Dependability. I was Team Leader of the Distributed Systems and Services Group (under the overall management of Prof. Jie Xu) at the University of Leeds between 2004-2017, and lead researcher on numerous successful research projects. I have also led several UK-China research collaborations including the highly-successful COLAB project, and have developed strong links with the Chinese Computer Science community. I have been involved in research into Energy-Efficient Cloud Datacenters since 2013; this has involved coordinating work undertaken by my PhD students and members of the Leeds DSS group to produce state-of-the-art energy-efficient scheduling algorithms for Cloud datacenters, giving talks at industry conferences and meetings to raise awareness of the role that software can play in improving energy efficiency, and working with the School of Mechanical Engineering at the University of Leeds to develop cross-disciplinary Data Center courses and establish links with local Data Centers. This work on energy-efficient scheduling has won international acclaim, including a Best Paper award at the 7th IEEE International Symposium on Service-Oriented System Engineering in Santa Clara, USA. Most recently, I am working as Co-Founder and CTO at Edgetic - a company aiming to use AI and Machine Learning techniques to provide software to greatly improve the efficiency (performance and energy) of container-based clusters. My work in Cloud Computing has been on-going since the year 2003 (when it was generally known as "Grid Computing"), and has spanned a wide variety of projects. This began with the "e-Demand" project at the University of Durham, funded by the EPSRC and the (then) DTI, which aimed to develop technology to facilitate coordinated resource sharing in dynamic, multi-institutional environments. I was responsible for designing and developing software to enable fault-tolerance in such systems (the ability to tolerate system faults and continue to provide correct service in their presence). I was heavily involved in the UK's "e-Science" core programme (a $400 million programme funded by the UK Research Councils), attending every UK e-Science conference and several international Open Grid Forum events, and most recently edited a special issue of the Philosophical Transactions of the Royal Society - the world's first science journal - on the subject. I am an active and long-standing member of the White Rose Grid e-Science Centre, and was formerly a member of the North East Regional e-Science Centre (NEReSC). I have supervised several PhD students who have focussed on Cloud Computing security and dependability, and I lead the international team who developed the "CROWN-C" distributed Grid middleware system that was featured in a 9 page article in IEEE Computer Magazine. My research into the subject of Software Dependability has also been a strong theme throughout my career. In addition to the fault-tolerance work I performed as part of the e-Demand project (see above), I completed my PhD thesis in 2006 on the subject of "Topology-Aware Fault-Tolerance in Grids". This thesis identified, for the first time, the "Common Service Problem" that can potentially hinder the application of fault-tolerant algorithms to service-based systems, and developed a solution using data provenance. I also obtained a MSc. by Research in the area of Fault-Injection testing, and authored a number of papers investigating the cost of n-channel fault-tolerant systems. My Dependability research is on-going, and has featured in my work for Rolls-Royce on the STRAPP project, as well as work my current PhD students are involved with; this won a Best Paper award at the IEEE ISORC 2012 Conference in Shenzhen, China. I have also worked in the Decision Support field for over 7 years, including as lead architect on the Innovate UK funded STRAPP project - working with Rolls Royce Plc. and Cybula Ltd. to develop state-of-the-art provenance support for their decision support systems. This involved writing software to integrate with and enhance Rolls-Royce's Equipment Health Management (EHM) system (for their aircraft engine monitoring systems), and Cybula's Brain Injury Index (BII) system (to provide decision support to neurologists). 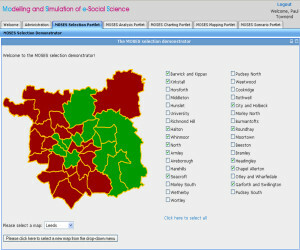 Prior to this, I worked on developing web portal based decision support systems for the ESRC funded MOSES and GENESIS projects, which aimed to allow local government and businesses to track and predict demographic changes in defined regions of the UK; this involved developing responsive visualisation systems, integrating the decision support system with back-end cloud-based processing, and developing a cloud-based storage system for end users. My work on this project received a Best Paper award at the UK e-Science All Hands Meeting, beating over 100 other submissions. In addition to the research themes described above, I have taught several postgraduate classes, chaired weekly research group meetings for over a decade, written multiple grant proposals, and successfully supervised seven PhD students. I have served as a committee member for many national and international conferences (information about this can be found in the "Committees" sub-section of this page.) Information about the major projects I have worked on can be found in the "Projects" section of this page. I was Co-author and Lead Architect on the “Enhancing Energy Efficiency in Data Centres” (E3DC) project. I developed the strategy and overall design, underlying architecture, file formats, analytic web services and web-based dashboard interface for a production-quality decision support system for Cloud data centres. I also developed new relationships (and liaising with) commercial partners to test the system in real-world environments. 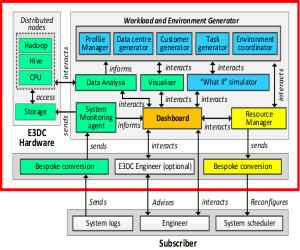 An impact acceleration project developing a unique analytical infrastructure and toolset for predictive decision support in the data centre (DC) sector. This integrates award-winning research into large-scale data monitoring, analytics (clustering analysis and behavioural modelling), and forecasting, through model-based simulation. This has great commercial value, offering significant efficiency gains for the DC industry as a whole. The work collaborates with companies across the UK DC industry. The project resulted in the successful completion of a seven figure investment in the new start-up company: Edgetic. I was Co-Author and Lead Architect on the STRAPP project. I developed an overall framework to integrate provenance information into the systems of two commercial partners (Rolls-Royce and Cybula) and was Lead Developer of a software demonstrator that integrates this framework into the Rolls-Royce EHM system for aircraft engines. STRAPP is a collaborative project to address the issue of trust in the use of shared digital systems, by developing innovative uses of provenance information to enhance the decision making process. The project developed an architecture and toolset to enable extracting and reasoning over huge volumes of provenance meta-data to improve user trust in decision support systems. Focussed on the healthcare (through Cybula Ltd.) and aeronautics (Rolls-Royce) industries, an ontology-based reasoning engine was developed to access data repositories and create traversable trees of metadata information. This was sent to a risk assessment mechanism, with personalised outputs visualised based on user role. 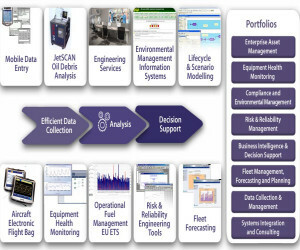 The outputs of this project were so successful that they have been embedded in the Rolls-Royce Equipment Health Management system, monitoring aircraft engines worldwide. I was Co-author and Researcher on the "White Rose Grid Phase III Platform Grant". In addition to helping to write the proposal, I developed application software for the project and helped to run the UK All Hands Meeting conference, attended by over 200 of the UK's top experts in Grid and Cloud. 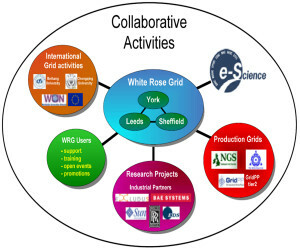 Continuing the highly successful "White Rose Grid" e-Science centre project involving Leeds, Sheffield and York. Phase III of the project further built the capacity of the WRG e-Science centre to offer improved access to WRG resources. This project was crucial to supporting existing large-scale computational research at Leeds and creating new projects through innovative technology for advanced distributed applications. Examples of projects that substantially benefited from the platform grant include GENeSIS and STRAPP. I was a Co-Author and Lead Architect on the "Generative e-Social Science" (GENeSIS) project. I refined and developed Web Services to process and display social-science simulation results, and developed a series of clients to interact with these services. I also developed an underlying infrastructure for project data, which utilised distributed storage and security. Based on the integration of two existing ESRC nodes (GeoVUE at UCL, MoSeS at Leeds), GENeSIS developed an analytics infrastructure to store, process, model, simulate and visualise large-scale social science datasets. Demographic simulation and transportation models were integrated, and agent-based models simulating crime patterns, educational provision, neighbourhood segregation, transport, and crowding were created. The project has resulted in the development of the Big Data Toolkit, open access mapping software in the form of MapTube, and a workflow based infrastructure for the generation of application portlets. I was Co-Author and Lead Researcher on the “COLAB: e-Science Collaboration between Leeds and Beihang in China For Grid-Enabled Visualisation Applications” project. 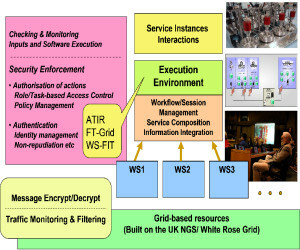 I co-authored and managed this international UK/China research collaboration, which resulted in the development of a Grid Middleware for High-Assurance Systems, incorporating security, provenance and fault-injection technologies. 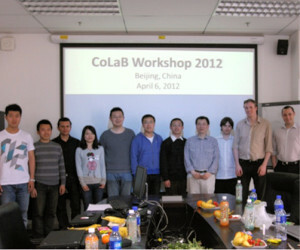 COLAB is an international research collaboration between the University of Leeds and Beihang University, China. Service-oriented technology developed at Leeds (network-level fault-injection algorithms, a topology-aware fault-tolerance scheme, and multi-party authentication tools) was integrated into the Beihang CROWN Grid middleware. This had wide international recognition, with the resultant middleware system published in IEEE Computer magazine. The project still runs, and now includes the National University of Defence Technology and Chongqing University. This has resulted in many joint papers and reports, and several staff and student exchanges occurring. I was an Architect and Researcher on the “Modelling and Simulation for e-social Science” (MoSeS) project. I developed an infrastructure to support e-social science experiments, through the use of service-based technologies. Additionally, I developed a computational architecture for the project as a whole, and was the principle developer of the project demonstrator systems. 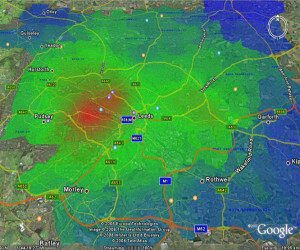 An interdisciplinary project between the University of Leeds Schools of Geography and Computing, and an early example of Big Data processing and storage, MoSeS utilised the 2001 UK Census dataset to generate a synthetic model of the whole UK population. This allowed social scientists to develop agent-based simulations to forecast population trends over multiple decades, and develop case studies with specific reference to health, business and transport. A service-oriented computational architecture was developed to distribute data storage over multiple machines (using Storage Resource Broker technology). HPC resources (the White Rose Grid) were utilised to split and parallelise processing for virtual population construction. The project outputs had significant interest from UK government due to their applicability for town planning support, and were integrated into the successor GENeSIS project. My first full-time research project - I conducted research into improving the dependability of service-oriented architectures (later also addressing "Grid Computing" systems). Specifically, I developed a topology-aware multi-version design fault-tolerance mechanism for services, and integrated this into the overall e-Demand architecture. I was later awarded a PhD for this work. A collaboration between the Universities of Durham and Leeds, Sun Microsystems, Sharp, and Sparkle. Fundamental dependability issues underlying large-scale coordinated resource sharing and problem solving in dynamic, multi-institutional virtual organisations were investigated. Developed tools included an attack-tolerant information retrieval system, services to provide n-version-design fault tolerance, fault injection testing of Grid software, and services for stereoscopic visualisation. e-Demand was named the best DTI e-Science project, with outputs that later informed a number of EPSRC and ESRC grants (such as MoSeS, NECTISE, White Rose Grid). I have authored/co-authored over 60 papers and articles, which have now been cited over 1000 times. These have been published in a variety of peer-reviewed national and international publications (my favourite being an 8 page article in IEEE Computer magazine.) I have also edited and guest edited a number of journals - most notably IEEE Distributed Systems Online and the Philosophical Transactions of the Royal Society. I used to keep a detailed list - including technical reports and smaller workshop reports - but these days, it has become increasingly difficult to keep on top of everything! The best way to find an up-to-date list of most of my publications is via my Google Scholar page. I regularly sit on the committees of national and international conferences, workshops, and editorial boards; the list below attempts to document these activities. I try to keep this up-to-date, but there may be omissions - these things are often hard to keep track of! Occasionally, I have been lucky enough to receive awards for various work that I and my students have performed. This page documents this recognition, mainly for my own record.